I am an avid reader of all kinds of books—if I could, I would read all day long. Since I have become a member of Goodreads.com, I have started writing short reviews of the books I've enjoyed (and a few I haven't!). Here's a selection of mini-reviews for books I've read recently and thought absolutely terrific, not to be missed. This book started slowly for me; I was having a hard time being drawn into the 1870's Texas of Captain Kidd, itinerant reader of the news. HOWEVER, as I continued into this historical novel, I became totally captivated, not only by the central character, an older man with high moral principles, but also by the haunting images of the prairies, hills, rocks, and rivers of the Texas frontier, what we have come to know as the Wild West. A rundown wagon bearing the label "Curative Waters" carries Kidd and his young charge, Johanna, a girl who had been stolen by an Indian tribe years earlier, through the lawless wilds of Texas to San Antonio where Kidd will deliver the girl to relatives. The development of their initially combative relationship and the dangers they encounter on their journey make for a fascinating story. Paulette Jiles's prose envelops us in the time and the minds of people struggling to survive in a rugged environment. Having lost his beloved printing business in the war, Kidd retains his connection to the written word (and earns a meager fee) by traveling from town to town reading selected stories from the world news, transporting his audience to places and events unknown to them. "...he had come to think that what people needed, at the bottom, was not only information but tales of the remote, the mysterious, dressed up as information...the listeners would for a small space of time drift away into a healing place like curative waters." His faithful care of Johanna becomes an adjunct to this work, "...knowing in his fragile bones that it was the duty of men who aspired to the condition of humanity to protect children and kill for them if necessary", and in time, he and Johanna become allies and then family. As Kidd dodges bandits and outlaws to keep Johanna safe, the story is as suspenseful as any I've ever read. Some scenes were remarkably like old-time TV westerns, but better. This is a wonderful story of honor and preservation of humanity in a lawless society. Jiles's characters, Captain Kidd and Johanna, are beautifully drawn. And there are lessons to be learned for the harsh times in which we live today. Sing, Unburied, Sing is a powerful piece of literary fiction - layered, complex, and thought-provoking. Written in the shimmering prose of Jesmyn Ward, the book explores the present-day culture of lower Mississippi, a place where paternalistic, racist beliefs still hold sway and where the heritage of cruelty inflicted on African Americans lives on to haunt succeeding generations. It is a heritage that has produced a modern day drug culture shared by whites and blacks alike, where its victims are compelled to go to any lengths, including abusing their own children, to get the love and drugs they need to feel "good." The story revolves around three generations of an impoverished black family whose members are all brimming with emotional energy: Pop the grandfather is weighed down with shame for not being able to protect his family; the grandmother, Mam, is full of cancer for which her Hoodoo potions provide no relief; Leonie, the neglectful, abusive mother is filled with self-hatred and grief over her brother's death; Michael, the white father of Leonie's children is full of hostility toward his racist father; JoJo, the thirteen year old son, trying so desperately to be a man, is burdened with fear of his abusive mother; and JoJo's toddler sister Kayla is filled with raw childhood needs. This all sounds so grim, but these brilliantly written characters are compelling and very real and a joy to read. The central character of the book is JoJo, struggling to protect his sister while managing his own transition into manhood. But it is in Kayla we find the greatest source of hope, the only one not yet spoiled by the legacy of systemic racism. An important element of the story are the ghosts, spirits of black teenagers who have suffered violent deaths, who haunt both JoJo and Leonie. While I feared this foray into the supernatural would be annoying, the characters were so deftly written, I actually found myself enthralled with these phantoms. I cannot say enough about the beautiful writing here - powerful imagery and poetic descriptions. I look forward to reading Jesmyn Ward's other books, both fiction and nonfiction. As I was reading Exit West I found myself mesmerized by a simple story told in a deceptively simple way. Saeed and Nadia, a young couple forced to leave their middle-eastern city because of violent civil war, are fearing for their lives. Sadly, this is a familiar occurrence in our present-day reality, destroying the lives of so many. However, through magical realism, a device author Mohsin Hamid uses deftly, Saeed and Nadia are able to move quickly from one migrant camp to another: the Greek island of Mykonos, London, and Marin, California. We come to see that each of these cities has been drastically transformed by an endless stream of refugees. When the couple starts out, they are deeply in love, but over time, under the stresses of the migrant experience, their relationship threatens to erode. Fortunately one thing they never lose is the commitment to care for each other, protect one another at all costs. Their tender companionship during migration is the focal point of the book. And yet the theme of a larger movement--through space, time and personal circumstances--is woven seamlessly throughout, presenting migration in a larger sense than that which we normally consider. Interspersed between Saeed and Nadia's experiences are unrelated stories of various unnamed people around the globe experiencing migration in their own way: a refugee from perilous circumstances lands in a woman's bedroom in Australia, an Irishman in Tokyo considers violence against a group of Filipinos, a young family finds itself in Dubai under intense drone surveillance, and a woman narrowly escapes a mob riot of migrants in her home city of Vienna. And so forth. And so on. Migration dominates this book's world (a futuristic one, but perhaps not too far into the future), causing unrest and war and deprivation, as well as further migration, one population displacing another. Migration, in all its guises, Hamid seems to be saying, is something we cannot and will not escape. It is the fabric of our modern lives. This author's lyrical writing catches us up in a world that is part reality, part futuristic parable. Saeed and Nadia are fascinating and thoughtful characters caught up in the hardships, physical and emotional, of forced migration. The reader wonders if their tender relationship will survive. Exit West is so richly thought-provoking, it deserves two full readings. Or maybe more. To read an Alice McDermott novel is to be immersed in a literary treat. Her finely-drawn characters, her exquisite imagery, and her profound empathy with the Irish-American community provide for a wonderful read. It's no wonder the book won the National Book Award. 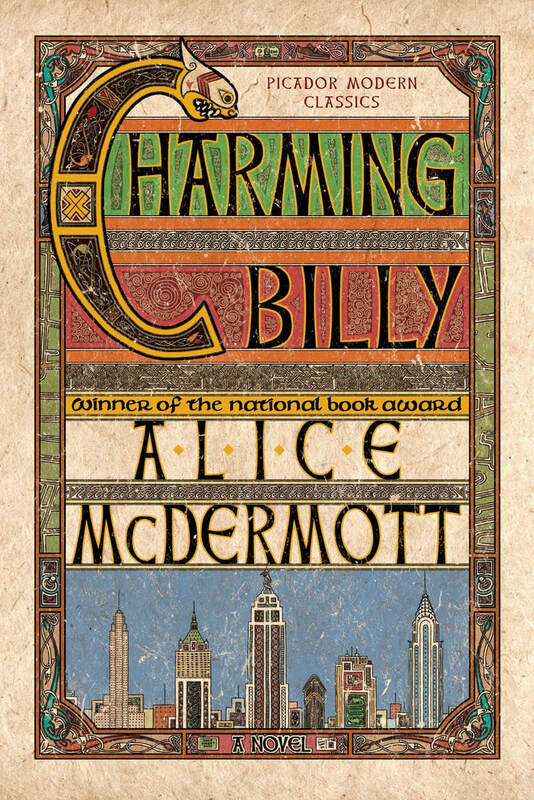 Set in the boroughs of New York City and on Long Island from the late 40s through the early 90s, Charming Billy tracks a neighborhood of Irish-Americans, their loves and disappointments, their weddings and funerals. The book begins with the wake following Billy Lynch's funeral and travels back and forth through time, via various points of view, revealing how, because of one seemingly harmless lie, an affable man who should have had the rosiest of futures becomes a hopeless drunk. A poignant story full of intricate homely details and touching characters and with the omnipresent Catholic church looming over all, the novel weaves the story of an entire generation in a close neighborhood where personal truths often lay hidden. As usual, McDermott's prose amazes me. The way she packs so much nuance into what at first seems a simple sentence makes for a slow but intensely pleasurable read. Well-meaning lies, secrets, betrayal, and the power of love and faith in one's family and friends create a colorful tapestry and a very good story. Elizabeth Strout—what a remarkable author! In this slight book—slight in size but not in depth—Strout uses spare prose to dig so deeply into the world of a woman's yearning for parental love, it takes your breath away. The writing is delicate and nuanced, and the reader must read every lovely simple sentence with great care in order to glean what is truly being said. The story is not complex: a young woman, Lucy Barton, is confined to a hospital bed due to complications from an appendectomy. She receives an unexpected visit from her mother whom she has not seen or spoken to in many years. The woman stays at her bedside for five days and nights, and as they make conversation, haltingly at first, then lapsing into hometown gossip, the truth of their painful relationship and Lucy's horrifying childhood are revealed. The way Strout slyly and subtly unveils Lucy's story is phenomenal. And while Lucy seems quite a placid character, we come to see she has actually had to be ruthless as she has managed her survival from abuse and severe isolation. A very engaging read, My Name is Lucy Barton explores the depth of longing and severe loneliness that might have destroyed a person but instead propel her through life. While it is not in any way sentimental, I found this book heartbreaking and highly recommend it. Anthony Doerr's All The Light We Cannot See is nothing short of brilliant. Set in World War II, two parallel story lines emerge: a blind girl and her father are forced out of their apartment in Paris and start a harrowing new life in a coastal village in Brittany, and a bright German orphan is torn from his home and forced at the age of sixteen into Hitler's army. How their two stories track and then converge make for a compelling read. Doerr's prose and imagery are stunning, and his characters, either courageous or cowardly in the face of war's horror, are strong and believable. This novel has everything a good novel should plus an enlightening historical context. A Must-Read. Plainsong is a phenomenal read for anybody who loves a beautifully written, enthralling story. Simple homespun language provides portraits of people in a rural Colorado town and their encounters with evil, goodness, loneliness, birth and death. In this his first novel, Haruf has created deep, true characters that stay with you - a pregnant teenager, a pair of small curious boys, a lonesome teacher, and two elderly farmers. They make you cry but without the slightest hint of sentimentality. The intricate details that make up their lives resonate so well. And the suspense in certain scenes is truly gripping. But what stands out in this book is the depiction of kindness. Pure kindness in the face of misfortune and cruelty. In its simplicity, Haruf's characters' goodness provides a worthy model to us in our overly-complex twenty-first century world. Looking forward to reading the next Kent Haruf novel! Being Mortal by Dr. Atul Gawande is essential reading for those who have a seriously ill or aging relative. It is also recommended for people who themselves are aging and long for a meaningful life even as their health begins to decline. The author writes about assisted living communities and how they often fail a resident's most basic requirements for autonomy. He also provides insight into our medical system as it aggressively treats severely ill patients while overlooking their truest needs. Hopefully we are transitioning into a new way of thinking, he writes, discovering what patients really want for their declining years and providing palliative care only, if that is what is desired. Dr. Gawande relays mistakes he himself has made as he gets caught up in a patient's false optimism and recommends surgery that has little hope of success. He also shares the story of his own father's painful illness and how he manages, with his son's help, to create for himself a fine conclusion to his life. Dr. Gawande describes how we might ensure, though our bodies ultimately fail us, that we have the best possible endings to our life stories. He explains why it is crucial for families to have the difficult conversations before severe health issues arise, to determine what an ill or aging family member truly cares about. As he puts it, people want and need to "grab on to something beyond mere existence." A powerful book, highly recommended. In simple yet powerful prose Marilynne Robinson takes us into the mind of Lila, who as a child was rescued from an abusive family by a woman named Doll. The pair joins a band of migrant farm workers, and, though Lila lives hand to mouth for years, she takes comfort in the life close to Doll and close to nature. When Doll disappears, Lila has to make her own way, becoming alone and nearly feral. On a rainy Sunday she wanders into a church, where the elderly Reverend spots her and is immediately smitten; he takes care of her and eventually marries her. Lila’s struggle to accept this loving, gentle man while clinging to the skirts of her former life is riveting. Time in this novel is like an eddy at the edge of a shimmering stream. It flows from past to present in Lila’s mind as she is torn between loving memories of Doll and acceptance of the love and kindness of the Reverend and the religion he symbolizes. At times Lila seems not entirely sane. Yet such is her mental strife as she grapples with issues of love, trust and faith. Fascinating characters, robust in their sensibilities, their doubts and fears, make for a phenomenal read. How does an impoverished, isolated, seventy-two-year-old woman fare in the war-ravaged city of Beirut, Lebanon? What An Unnecessary Woman's protagonist, Aaliya Saleh, does is immerse herself in literature, surrounding herself with authors from around the world—Spinoza, Conrad, Nabokov, etc., and aligning herself with fascinating fictional characters. When electricity is available, she listens to musical masterpieces—Chopin, Mahler, Beethoven. And she delights in the rituals of her labor of love—creating Arabic translations of obscure novels and biographies. In this way, Aaliya endures her solitude and persistent fears—all the while suspecting the utter futility of her efforts. That this poignant novel, filled with bitter humor, was written by a man, Rabih Alameddine, is astonishing, as the depth of Aaliya’s old-woman mental torment and physical suffering are so convincingly depicted. The author has incorporated many literary references, which, if the reader researches them (thank you, Google), provide interesting clues to the mysteries of Aaliya’s state of mind. An outstanding piece of writing, an extraordinary character, and a compelling story—highly recommended. How can a book be hilarious and heartbreaking in the same moment? It can if it's written by Roz Chast who has a keen sense of the absurd within the rigors of reality. Composed of cartoons and narrative which complement each other perfectly, this memoir concerns Roz Chast's managing her elderly parents as they grapple with their extreme old age. Between her domineering, always-in-denial mother and her timid, senile father, both in their nineties, Chast has an immense task on her hands. In addition to getting them set up in assisted living and worrying about their rapidly depleting finances, she is also forced to sort out her intense feelings for both parents. All this is told by means of extremely funny cartoons and captions. Can't We Talk About Something More Pleasant is a phenomenal read. I have to put this book into the 5-star "Amazing" category. the life-changing magic of tidying up (note each word of this title), a little book written in an elegant, spare style, lays out a method whereby we can simplify our lives and come to surround ourselves with only the possessions that give us true joy. As a result of reading this book, I've already tidied my study and thrown out four bags of useless paper documents, and all that before I've even begun to follow her procedure for tidying. I already feel better! I recommend this book to anyone who wants to clear their homes and their brains of excess clutter.